When it comes to having it all, some areas of the world are uniquely — maybe even unfairly — blessed. Places like beautiful Coastal San Luis Obispo County (SLO CAL), a hidden gem right between San Francisco and Los Angeles. 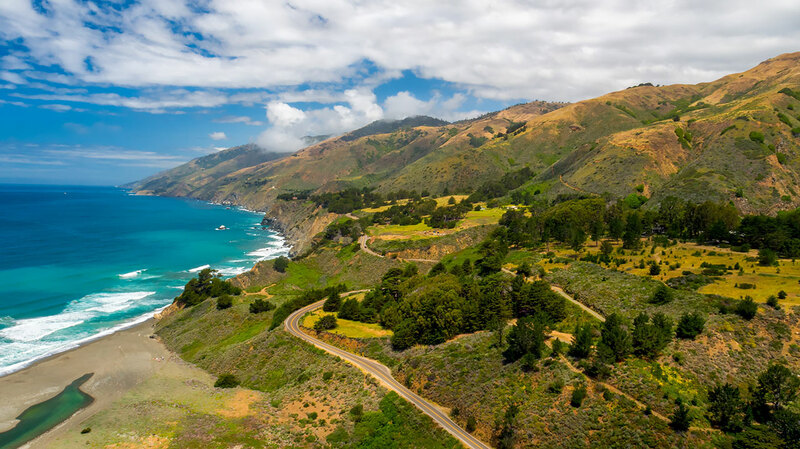 Stretching from Ragged Point to Nipomo, the scenic, 101-mile Highway 1 Discovery Route serves up everything you crave in a road trip, from charming coastal towns to jaw-dropping vistas, diverse wildlife to a vibrant farm-to-table food scene and preeminent wine region. Add an historic castle, some otherworldly sand dunes, and a laid-back, untouched vibe, and it’s easy to understand why the Highway 1 Discovery Route earns our pick for one of 2018’s must-visit destinations. To help you best experience all this unforgettable region has to offer, we’ve put together a bucket list of must-see destinations and must-do activities. Read on to learn more, and don’t forget to visit www.Highway1DiscoveryRoute.com to start planning your adventure. Turns out you don’t need to visit Europe to tour a castle in all its grandeur. Located just off Highway 1 in San Simeon sits Hearst Castle, arguably America’s most opulent abode. A 28-year project of America’s original media baron William Randolph Hearst, this 170-room dream home evokes the grand palaces of Renaissance and Medieval Europe with its ornate, old world architecture and Versailles-like size and decadence. First time visitors should check out The Grand Rooms Tour (one of seven guided experiences available), which will have you feeling like one of the showplace’s many famous guests (from Charlie Chaplin to FDR to Greta Garbo) as you waltz through rooms, marvel at priceless artwork and check out the indoor mosaic pool inlaid with gold. When you’re done with the tour, be sure to scan the water for whales. San Simeon is the NOAA’s southernmost end of the Monterey Bay National Marine Sanctuary, and one of several Pacific Whale Trail sites—where grey whales migrate from Alaska to Baja for feeding—off of Highway 1. No, you haven’t touched down in the Sahara or somehow stumbled onto the set of the latest Star Wars film. You’re in Oceano Dunes Natural Preserve, an epic 3,600-acre playground of pristine dunes. Located in the Pismo State Park, the Oceano Dunes State Vehicular Recreation Area offers ocean and mountain views and is accessible via car (for a small fee) or by foot. But, for our money, the best — and most exciting — way to experience this otherworldly paradise is on the back of an ATV or behind the wheel of a dune buggy. Both are available to rent through local outfitters, who will even drive you to the park from town. Four wheels not your speed? You can also go for a horseback ride, hit the waves for a kite boarding lesson, or just kickback and watch hawks, seagulls and other birds. We all know that the central coast is vibrant with ocean blue water and lush green hills, but what about the unmistakable black and white stripes of…zebras? Yes, your eyes are not deceiving you. The zebras you see flecking the pastoral hillsides outside San Simeon today are descendants of zebras that once belonged to William Randolph Hearst, who set them free from his zoo in the 1950s to graze on his 82,000 acre ranch. Marine mammals abound along with Highway 1 Discovery Route. Like magnificent Elephant Seals, which swim thousands of miles twice a year to Piedras Blancas. Home to an Elephant Seal Rookery, this beautiful section of coastline doesn’t require an admission fee or reservation. Perch along the boardwalk, where you can watch these beautiful mammals lounge on the sand, swim in the waves and — every January through March — even give birth. (other cool facts: 25,000 animals annually with over 1,500 pups born in 2016). Speaking of diversity, San Luis Obispo County (SLO CAL) boasts one of the most vibrant food scenes in the country. Chalk it up to the natural setting — the rich soil, the verdant farmland, the proximity to the Pacific — and the array of creative people, each of whom bring their own culinary styles and traditions. Here you’ll find everything from runny farm fresh eggs and avocado toast to grass-fed lamb, Santa Maria-style BBQ (think spicy, tri-tip steaks, made famous in this region), and Mexico City-style tortas and blue corn tortilla tacos. Looking to sample something the locals love? Order the Abalone, a mollusk — and central coast staple — that is as tasty as it is strange looking. With everything from local fish markets (where harbor seals will practically peel up to your table as you enjoy the day’s catch) to award-winning restaurants helmed by innovative chefs, the Central Coast’s food options will fill up your bucket list and your tummy. With its green landscape and ocean vistas, it’s not surprising the Central Coast often gets compared to Ireland, albeit with a bit more sunshine. Take it all in as you cruise down the Highway 1 Discovery Route, over the undulating hills and passed breathtaking vantage points on the north coast. But the comparison is truly merited in Montaña De Oro State Park, where the mild climate, rolling mists, lush, wildflower-flecked hills and ocean views evoke the magic of the Emerald Isle. Make a pit stop along the cliffs to enjoy a network of hiking and biking trails, then cool off with a dip in Spooner’s Cove — one of our favorite secluded beaches. Fantastic wine has to be on the bucket list of any well-versed traveler, and fortunately you’ll find vineyards rivaling Europe’s finest right here along the Highway 1 Discovery Route. From the verdant Edna Valley to the foothills of the Santa Lucia Mountains in Cambria to the beautiful Arroyo Grande Valley, visit world-class wineries that — somehow — seem to still remain undiscovered. But if the wine scene is off the radar, the wines themselves are decidedly on point. Enjoy Pinot noirs, syrahs, chardonnays, and rieslings in rustic tasting rooms, and restaurants with bucolic views. And don’t forget to sip a few award-winning cabernet sauvignons, which benefit from the region’s Napa-like climate and Bordeaux-like soil. Want to pair wine with waves? You can also visit several tasting rooms within a stone’s throw of the ocean in Avila Beach, and taste cider made from apples grown right in Avila Valley. No bucket list would be complete without a few must-see tourist destinations; thankfully, coastal San Luis Obispo County’s are as unique as they come. For starters, head to Cambria’s CA Covell Clydesdale ranch, where you’ll find 100 Clydesdales roaming this pristine, 2,000-acre property that stretches from forest to sea. While they are somewhat wild, these giant horses are used to visitors and will let you pet them as they graze (you can even book a trail ride). Views abound along the Highway 1 Discovery Route, but the best might be found at Piedras Blancas Light Station, a 70-foot lighthouse on the National Register of Historic Places. Get a guided tour for insights on this nautical icon, and be sure to gaze out over the bluff and at the sea below, where you’ll see Elephant Seals lounging on the beach. Sunsets are particularly mesmerizing here. Heights aren't your thing? Take in lovely ocean views and clean salty air along the historic pier in quaint Cayucos. At nearly 1,000 feet in length and nearly 150 years in age, this piece of maritime history transformed the small beach community into a main trade port for ships coming from Los Angeles and San Francisco. It was constructed by sea captain James Cass, who left his native New England in the 19th century to settle Cayucos. Today, you can visit Cass' home, the Dana Adobe at Rancho Nipomo Historical Park, a preserved piece of history where you can learn everything from adobe brick building to tortilla making to traditional Mexican dance. Cap the day by unwinding at the Old Cayucos Tavern & Cardroom, a 1906 saloon that still feels like a frontier cowboy bar with its timber walls, dollar bills pinned to the ceiling and spirited games of poker.